This top depicts Hotei, one of the Seven Lucky Gods from Chinese folklore. In the West, he is known as the Laughing Buddha, and is often depicted as a cheerful fat bald man. Often shown entertaining others, here he is depicted drunk. 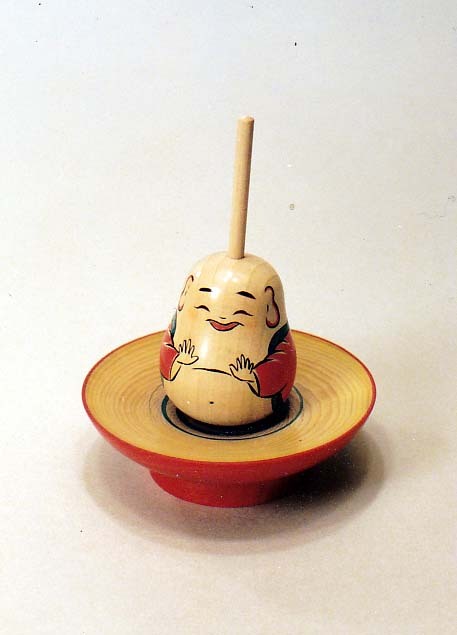 The base in which the top is spun is shaped like a sake cup, and when the Hotei top finishes spinning, it looks like he has drunkenly fallen over. Hiroi Michiaki: Ah. This is the drunken Hotei (god of luck). Mrs. Hiroi: The drunken Hotei is intoxicated. Hiroi: This is the god of luck Hotei from the Seven Lucky Gods. He’s drunk, and if you spin him, he staggers about inside of a sake cup. And in the end he flops and falls over.